Joel Silverman has trained animals for Hollywood films, TV, and amusement parks, and he now devotes his forty years of professional experience to helping thousands of pet owners train, and care for their dogs. Joel has worked behind the scenes on lots of shows and films, but he’s best known for Good Dog U—his top-rated Animal Planet series. Joel authored three books to share his expertise with pet owners: What Color Is Your Dog?®, Take 2 - Training Solutions for Rescued Dogs, and Bond With Your Heart; Train With Your Brain®. Joel’s personal mission is to teach owners simple ways to achieve responsible pet ownership. These techniques focus on taking small steps that can be adjusted to each animal’s unique personality. “There are different ways to teach an animal a behavior, and we can’t expect every animal to learn in exactly the same way,” Joel says. Since most of the dogs returned back to animal shelters and humane societies are there because of behavior issues, Joel believes training can play an integral role in decreasing these numbers the suffering of animals. He brings his talent and passion to helping pet owners bond with, train, and nurture their dogs. Animals fascinated Joel at a young age. Los Angeles–area native, his family visited Sea World every summer. With each visit, Joel became more interested in the marine mammals and their trainers. His curiosity led him to experiment by training Shadow, the family dog, using the same techniques he saw the Sea World trainers use. Shadow had always been a skittish animal, but she gradually became more confident and relaxed while learning dozens of new behaviors. Reflecting back, Joel attributes that early success with Shadow to a fundamental principle of his training philosophy, one that those Sea World trainers shared in common: a bond of trust with the animal. Joel’s persistence and passion for animals earned him the opportunity to begin training marine animals early in his career. Sea World offered Joel his first big break working with dolphins and orca killer whales, and his experience working amusement park marine shows later took him to Universal Studios and Knott’s Berry Farm. Joel invented the award-winning “Triple Bow” behavior—an exhilarating ride for the trainer who is pushed fifteen feet into the air by two dolphins! He was awarded the “Behavior of the Year” at the annual International Marine Animal Trainer’s Association (IMATA) conference in 1987. His time with the marine animals he loved taught him how a relationship of trust can motivate an animal to learn and perform, and that’s been one of the pillars of his training method ever since. Joel’s early work in TV and film included collaborations with training legend Ray Berwick. Berwick is best known for training the birds in Alfred Hitchcock’s thriller “The Birds”, but he was also a pioneer in positive reinforcement training. Joel got to learn Ray’s methods firsthand, and positive reinforcement has been another pillar in Joel’s method ever since. Joel’s TV and film credits as an on-set trainer include such household titles as A Good Year starring Russell Crowe, the screwball comedy Mystery Men, the hit TV series Empty Nest, and Joel was responsible for the training and coordination of most of the IAMS national commercials and print ads from 1997-2014. From 1999 – 2009, Joel hosted the top-rated Animal Planet show Good Dog U. The show focused on proper training and care for dogs spotlighting Joel’s Hybrid Method. Millions of viewers tuned in for Joel’s expertise during the show’s ten-year run, and his contribution to dog-training was recognized with a “Trainer of the Year” award from the Westminster Dog Show in 2008. Inspired by his TV viewers’ feedback and questions, Joel wrote What Color Is Your Dog?® to explain his techniques in more detail. “I wanted to help soon-to-be pet owners select the right dog and help current pet owners better train their dogs while keeping in mind that each dog has a unique personality.” Take 2 – Training Solutions for Rescued Dogs followed up a year later, offering more resources that accounted for dogs’ varying backgrounds, issues, and prior training. 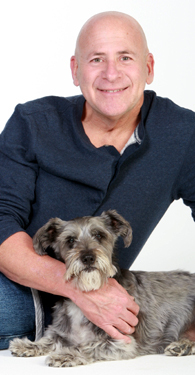 From 2011-2014, Joel hosted a nationally-syndicated TV series, What Color Is Your Dog?® which aired in 70% of the U.S. At about that same time, he also patented “The Alternative Collar”—his special design for a dog collar that reduces pressure on the dog’s throat, so trainers have more control and animals have no discomfort. In October 2014, Joel was contacted by Chase bank, and was asked to be involved in their national Chase Mastery campaign. This involved having his picture in most Chase banks across the U.S., as well as being highlighted in a three national commercials. Currently, Joel lives in Reno, Nevada with his wife Michelle, and their two dogs Foster and Duchess. Foster was Joel’s co-host on the TV series What Color is Your Dog?®, and traveled around with him on his book tour in 2009 and 2010, performing in over 35 states. Duchess was featured with Joel in the Chase commercial.